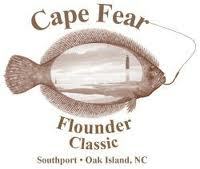 The Cape Fear Flounder Classic will be held from 5 p.m. Friday July 27, 2012 – 8 p.m. on Saturday Jul. 28, 2012. If you’re coming to North Carolina for it you’ll need somewhere comfortable to stay. Check out the many fine Sunset Beach NC vacation homes we have available during that time period. The Cape Fear Flounder Classic tournament begins at 4433 Long Beach Rd, Southport, NC 28461 and is by boat only. Entry fee cost $100.00. Registration begins at the chamber from 10 a.m. until 4 p.m. Monday through Friday from July 11 through July 27. Registration at the marina will be on July 27 from 5 p.m. until 7 p.m. Lines in the water will be on Saturday from 7 AM until 4 PM with weigh-in starting at 3 p.m. and an awards ceremony at 6 p.m. Guaranteed CASH Prizes isn’t a bad reason to take up flounder fishing during the Cape Fear Flounder Classic at the Southport Marina on July 28th. Over 50 boats participated in 2011 and we are looking for a bigger crowd this year. For a brochure please contact the Chamber at 457-6964. Organized by the Southport-Oak Island Chamber of Commerce. Also on July 27 is the Ocean Isle Beach Concert Series taking place from 6:30 – 8:00 p.m. Blackwater Rhythm & Blues performs on the stage in the parking lot at Museum of Coastal Carolinas on Ocean Isle Beach. If you’re in need of Sunset Beach NC vacation homes for your time here, give us a call at Sloane Realty at (866)-931-5201 and we’ll help you find exactly the type of rental you’re looking for.